When the middle of the semester hits and everything is in full force, it’s not uncommon to crave meals that remind us of family and home, and all of that other comforting goodness. This is especially true when holidays are right around the corner. While I’m lucky enough to live fairly close to home and can easily visit my family any given weekend, I know that this is not the case for many college students. I can’t imagine going an Easter without eating some lamb roasted on the spit (it’s seriously the best thing ever). So what better way to remind yourself of family this April than make a traditional Easter dish (or, if you don’t celebrate Easter, a springtime meal). Of course I realize that roasting lamb on a spit in your dorm or apartment is not an option–not only is it illegal and would probably result in expulsion/eviction, but it’s also incredibly dangerous. To make your life a bit easier, I would suggest going for one of your family’s specialty side dishes to evoke and celebrate. 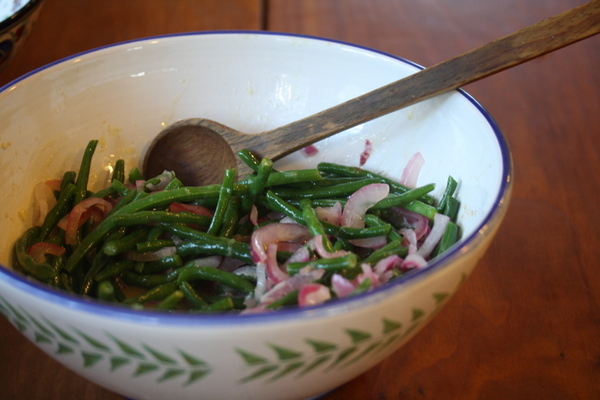 That said, besides lamb Easter makes me think of my grandmother’s Greek-style string beans – aka, Fassolakia Ladera. Cooked in a tomato sauce with fresh herbs and finished off with a truly Greek helping of olive oil, these beans do not disappoint. They’re a fixture at our family’s Easter buffet every year and are a favorite among all forty people there. That’s not an exaggeration either–the buffet and numerous cousins are both real; I am Greek, after all. This recipe is straight from my grandmother; although she’s not yours, I hope that you’ll be able to taste the love and care that goes into these yummy string beans. When she gave me her recipe she warned that she’s not an “exact cook” and that her measurements are generally eyeballed. It’s just the Greek kitchen way I suppose. Using a sharp knife, top and tail the string beans, and cut in half or leave whole. Saute the onions and garlic in the olive oil in a large saucepan over medium heat. Wash and drain the string beans and add them to the pot. Saute for about 5-7 minutes stirring constantly. Then add the herbs, tomatoes and sauce, salt and pepper, and a little water if needed. Cook for approximately 30 – 45 min on medium heat until tender enough for your taste. Grandmother’s tips for you: I use very little pepper. Add water if sauce seems to be too thick and make sure there is enough because if not the string beans will stick to the pan and burn. Our family usually has quite a bit of sauce, so there’s plenty for bread dipping once the beans are gone. And since no meal is complete without something sweet, perhaps you’ll finish off this Greek meal with some delectable BGSK baklava.